In this groundbreaking book, business and life coach, Ryan Hodge addresses topics that may be taboo in many circles but his direct and authentic approach will leave readers at ease and help them to get in touch with their authentic selves. 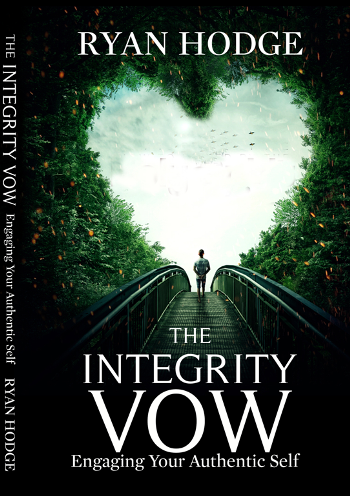 Ryan uses his own life, marriage and addictive experiences as a roadmap that will help anyone understand how to make their own Integrity Vow. When our relationships with others suffer - whether it's from infidelity, addiction or some other form of pain - it's always a symptom of a deeper issue. That issue centers around our unawareness of knowing our deeper self. Once we chip away the outer layers of "what is," we begin to understand what can be. "Ryan really opens up your mind, heart, and soul with his exposed honesty. You are riding every emotional experience with him, hanging on your seat wondering where you are headed through these shared experiences and journey. You will watch his enlightenment open up before you as he exposes his souls rips and tears, both of you awakening together."